Creamy Mushroom And Chicken Pasta Recipe - This recipe is about chicken pasta and mushroom that make together tasty and healthy. Follow this simple steps to cook one of the best chicken pasta recipe. 1. Heat 2 tablespoons olive oil in a large pot on medium heat. Add chicken and brown, making sure to cook through. Set chicken aside. 2. Add 1 tablespoon olive oil and the onion into the pot and stir. Cook down for 1-2 minutes. 3. Add mushrooms and garlic, and stir to incorporate with the onion. Season with salt and pepper to taste as well as thyme and paprika. Stir to evenly season. 4. Add chicken broth and heavy cream to the pot and stir. Bring to a boil, then add the farfalle pasta. 6. 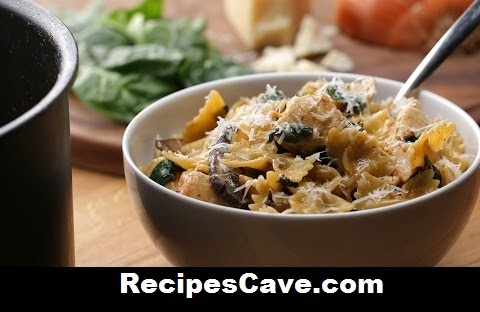 When the farfalle pasta is al dente, add the spinach and chicken and stir until the spinach cooks down and incorporates. Add parmesan and stir until it’s well-incorporated and you’re left with a smooth sauce. 7. Top off with extra parmesan. Your Creamy Mushroom And Chicken Pasta Recipe is ready to taste.